To understand the advantages and options of SD- WAN technology, first of all let us understand what is SD-WAN technology. Well SD-WAN or Software Defined Wide Area Networking is a metamorphic approach to simplify branch office networking and assure optimal application performance by simplifying networks between remote locations and branch offices. For example, a WAN might be used to connect branch offices to a central corporate network separated by distance. In the past, these WAN connections often used technology that required special proprietary hardware. The SD-WAN movement seeks to move more of the network control layer is to the “cloud,” using a software approach and in the process centralizing and simplifying network management. What Do Enterprises Need in an SD-WAN Architecture? Enterprises have been increasingly investing in open, flexible cloud solutions. SD-WAN being one of them is particularly beneficial to environments separated by distance. For example, between main offices and branch offices. Whereas traditional WAN can be expensive and complex, SD-WAN architecture reduces recurring network costs, offers network-wide control and visibility, and simplifies the technology with zero-touch deployment and centralized management. Apart from the SD-WAN benefits the primary advantage of an SD-WAN architecture is security. In the SD-WAN architecture, a company benefits from end-to-end encryption across the entire network. All communication between the main office and branch offices is secure, as is communication to and from the cloud. Premises-basedSD-WAN solutions- This solution involves an appliance that is placed onsite to achieve SD-WAN functionality. Premises-based SD-WANs can be cost-effective solutions for smaller and localized businesses. MPLS-basedSD-WAN solutions- This solution involves multiple appliances placed at network endpoints. These solutions create a virtual IP network between the vendor-proprietary appliances, giving them control of network packets from end to end. Internet-basedSD-WAN solutions also use multiple appliances at each customer location, using public Internet connections from customer-chosen providers. 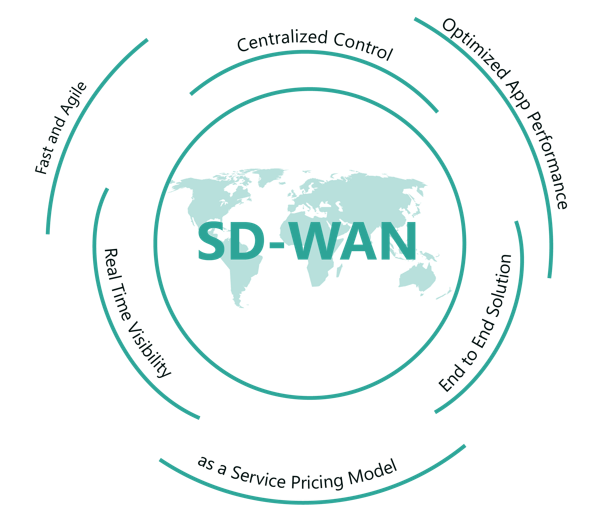 The customer pays for a portion of its Internet connections to be SD-WAN.